I spend hours a day researching what New York Times columnist Thomas Friedman calls “global weirding”: the destabilization of our weather system fueled by the three million tonnes of fossil fuel pollution we inject into it each hour. So it is a rare day when something shocks me as much as a recent U.S. National Aeronautics and Space Administration (NASA) report on last year’s extreme rainfall. As most locals know from soggy personal experience, our corner of planet Earth since last spring has been a bit wetter and greyer than normal. And next door, our Washington neighbours donned their gum boots and slogged through their fourth wettest year since 1895. Still, we got off lucky. Very lucky it turns out. According to this jaw-dropping NASA report, worldwide rainfall and snowfall were so extreme, in so many places last year, that sea levels fell dramatically. 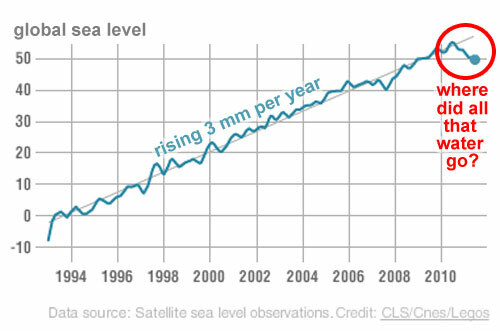 Sea levels have been rising steadily for over a century as the ever warmer ocean water expands and the world’s remaining glaciers and ice sheets melt. 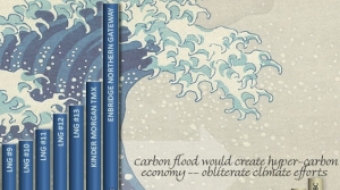 In fact sea levels are rising twice as fast now as they were a few decades ago. As the NASA chart above shows there have been some ups and downs but nothing in the modern satellite record comes close to the 6 mm drop worldwide last year. While 6 mm might not sound like a lot, when collected from the surface of all our planet’s oceans it adds up to 26,000 gallons of water per human. 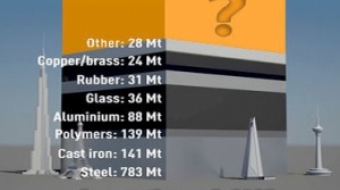 So just where did all this missing water go? The ringleader of the great water heist was one of the strongest La Nina cycles of recent times. La Nina shifted and altered weather patterns causing extreme precipitation to funnel into places like India, Pakistan, Australia, and northern tiers of both South and North America. 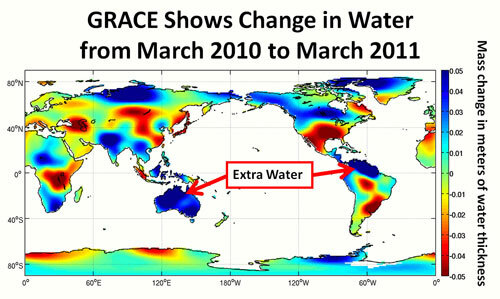 In the map below, produced from NASA’s GRACE satellite data, blue indicates areas that gained water last year. 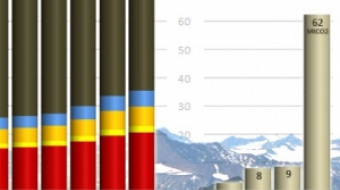 The darkest blue areas gained as much as 50 mm in one year. These dark blue spots are also the sources of the world’s epic floods of the last couple years which not only left tens of millions homeless and destroyed agriculture and infrastructure, but also left behind so much water that global oceans were depleted by 6 mm. 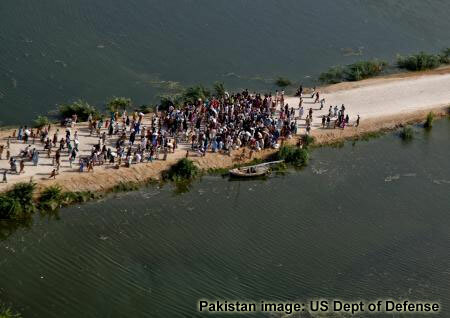 One fifth of Pakistan under water displacing 20 million people after freak monsoon rains that wouldn’t stop. 140 million Chinese affected by weeks of record flooding and landslides. 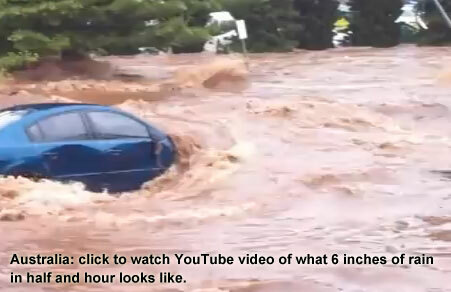 “Biblical” flooding in Australia covers an area the size of France and Germany combined. Australia had its wettest spring since records began 111 years ago, with some areas suffering over 4 feet of rain. At one point freak rains of six inches fell in just 30 minutes. Another town got 14 inches in one day. If Oprah Winfrey is willing to plug "Ethical Oil", why stop with the tar sands?